Theresa May should "get stuck in" to the talks process to restore power-sharing at Stormont, the shadow Northern Ireland secretary has said.Owen Smith said it was "completely inexplicable" that the prime minister had visited the region just once since its executive collapsed in January.Talks between the Democratic Unionist Party (DUP) and Sinn Fein to resolve the crisis broke down on Wednesday.As a result, the government said it had to step in to set a Stormont budget. Northern Ireland Secretary James Brokenshire laid out his plans for a budget to MPs on Thursday, but was adamant that it did not mean a return to direct rule from Westminster for Northern Ireland. If and when a budget is presented, it will not mean an end to any chance of a return to devolution, he said.It will not "set out any spending decisions by me or the government", he added, but will incorporate figures from Northern Ireland's civil service. Mrs May and Taoiseach (Irish prime minister) Leo Varadkar discussed the situation in a phone call on Wednesday night and agreed that the gap between the parties was "narrow".The DUP and Sinn Fein have failed to reach an agreement in spite of numerous rounds of discussions since March's Northern Ireland Assembly election.That vote was called after the Northern Ireland Executive collapsed amid a bitter split over the handling of a botched renewable energy scheme in January.Sinn Fein's demand for legislation to give official status to the Irish language has become one of the main stumbling blocks in negotiations to restore the executive. The Labour Party's Mr Smith said he wanted to see Mrs May make more effort towards finding a solution to the political stalemate. 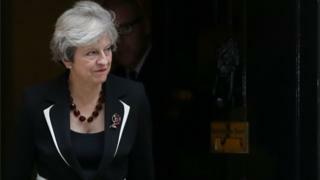 "She has not attended a single substantive session of the talks in Belfast and she has not made a single substantive intervention to try and move things along," he told MPs. "I know things have been difficult recently, but frankly the odd phone call to the taoiseach just isn't good enough. "It may be true that the days of a prime minister or president flying into Belfast to fix things are past and overstated, but they could at least give it a go." However, Mr Brokenshire said the prime minister has had meetings with the Stormont parties at Downing Street. "She does remain actively involved, including continued discussions with the taoiseach, on the right way that we can work together," he added. He also said he would "reflect carefully" on the salaries of Stormont's assembly members (MLAs), amid calls for them to be docked until a power-sharing deal is reached.Mr Brokenshire said he would take independent advice on the issue because allowing the existing pay arrangements to continue was "not tenable". "This is a devolved matter and I cannot intervene without primary legislation in Westminster," he said.On Wednesday, Mr Brokenshire said government intervention had become necessary because Northern Ireland's public service would begin to run out of resources by the end of this month.Sinn Fein said the latest talks had "ended in failure", while the DUP said progress towards a deal had been held up by Sinn Fein's "narrow political agenda".They have both said they were prepared to take part in more negotiations but none have been planned.Speaking in the House of Commons on Thursday, DUP MP Jeffrey Donaldson outlined a key demand his party had made.He said the party was seeking the implementation of the Armed Forces Covenant, a promise to look after military veterans though priority medical treatment, help to find housing and other measures.